This week, I received four postcards from Russia, Hong Kong and Australia. It’s been a great week receiving all these beautiful postcards in mail. Rottenst Island is an island located off the coast of West Australia. It is a popular tourist destination and has about 500,000 tourists annually. The Basin, which is featured on the postcard, is one of the most beautiful and popular swimming spots on the island. This postcard features the city of Tai O in Hong Kong. Tai O was a old fishing village located on Lantau Island in Hong Kong. It is very famous for the stilt houses (Pang uk) which are illustrated in the picture; and also for their seafood, shrimp paste and dried salty fish. When I first received this postcard, I felt like it was rather an artistic piece and I wasn't sure what it was trying to bring out. But it seemed to be bring different cultures and religions into one postcard. It says on the card that it is the Evgeny Tonkikh "Carnival" on canvas. Sender mentioned that she also enjoy learning new languages and it's a way of opening windows into a foreign culture. Sender also added a cute cat sticker on the card :) How cute !!!! Hope everyone is enjoying this wonderful holiday season. A beautiful multi-view card from city of Metz. Sender said she enjoys eating ice cream at the lack in the summer. I mean...that definitely sounds fun doesn't it? I'd totally do that too I also very much appreciate the Totoro drawing she attempted on the card. Sender bought this card from France during her travel last summer. This is a absolutely beautiful card due to the fact that I LOVE purple and lavender. I could almost smell that wonderful scent out of this postcard. All three postcards features views of the Aurora Borealis. Hello everyone :) WalaGemini here. Is everyone anticipating their Christmas holiday and presents? I just finished my last 3 final essays...It was a stressful and long week..
Today I would like to share with you some postcards I bought online. Some of you may probably have heard of it. 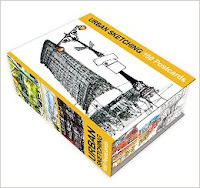 It is called The Art of Urban Sketching. The box contains 100 postcards that have different drawings of cities views on them. While most of them are paintings, some are black and white and some are drawn with ball pens. The ones I'd like to share with you are postcards with Hong Kong illustrations on them. They are all very beautiful postcards and made me realize how awesome my city actually is. A street view of Wing Lee Street. Although the houses seemed to be old, there are still people living these apartments. A Star Ferry that runs on the Victoria Habour everyday. Its a rather short ride but you're guaranteed to get a nice view of Hong Kong on a sunny day. View from the Peak. Hong Kong is definitely a city that is packed with buildings. An older fisher's boat that is still in use. Usually spotted in Sai Kung and Quarry Bay areas where people fish for a living. What do you think? Do you think these gives a realistic representation of Hong Kong today? Would you like to visit this city if you knew nothing about Hong Kong but these pictures?